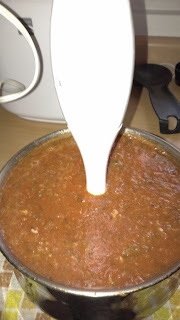 I promised to share my homemade spaghetti (or pizza) sauce recipe on my homemade pizza post. I guarantee it is delicious! 1 can of whole tomatoes in tomato juice. No other flavors. This is important as it'll change the flavor of the sauce in the end. Add the tomatoes. I use Hunt's whole tomatoes for this recipe. Add salt, basil and oregano leaves to taste. Let it boil on medium heat for 10 minutes. Remove from heat, and use a blender to puree your sauce. I use my handy-dandy handheld blender, which makes this step a breeze. Be very careful, as the sauce if very hot! Return sauce to the stove and let it boil for 5 minutes. At this point you can add ground meat or what I usually do, homemade meatballs. Yummy! I usually buy a big can of Hunt's Whole tomatoes at Costco and make a big batch of sauce. When I do this, I use the whole garlic bulb, cloves peeled, of course. Then I place it in freezer bags or freezer safe bowls, and freeze for a quick meal on busy days. This sauce is delicious, thick and so easy to make!